The Saturday night after Thanksgiving started out like any other night: we put both kids to bed and spent some "grown-up" time watching TV, blogging, etc. Just as we were crawling into bed about 10:30ish, Cooper woke up and wanted to eat. He typically does not get up this early in the night (it's usually more like 1 or 2 am), but it does happen occasionally, so it didn't throw us too off guard. I was *just* settling down to sleep, so we agreed that Matt would feed him and I would handle if he got up in the middle of the night. While Matt was making the bottle, I could hear through the monitor that Cooper was getting SUPER upset. I mean, he'll start hollering if you take too long to get in there, but he usually has a fairly long waiting period. By the time Matt got in there, he was almost hysterical. I kept listening in the monitor, but it just sounded to me like Coop was GULPING down the bottle. The I heard Matt say, "Robyn - get in here NOW". I ran in there and immediately could hear what was wrong: Cooper couldn't catch his breath. What I thought was me hearing him gulp his bottle over the monitor was actually him gasping for breath. Then we heard the cough. It was the WORST sound that I have ever heard. It was like a barking - very strong, and very deep. In between coughing, he was doing a very LOUD gasping for air. Immediately we were scared to death and knew we were taking him to the ER. We are very lucky to be blessed to live in the same town as all of our parents. This means that, typically, there are three sets of grandparents within a 15 mile radius of our house. Of course, this certain weekend two of those sets were out of town. I took Cooper while Matt got dressed and tried to call my Dad. Their phone has been having issues and, of course, wasn't working. Matt's brother lives on the same road we do (about 2 miles away). We called them and Aunt Missy said she would be right there. Aunt Missy got there to stay with LL (while she slept - she never woke up during any of this), and we took off in the car. Matt got on the phone with 911 to let them know that we were on our way to the ER with a 5 month old who was having trouble breathing. I sat in the back with Cooper and just rubbed his face and talked to him. I know that it sounds dramatic now, but I literally was scared that I was going to watch my baby stop breathing right before my eyes. Even Matt was on the verge of tears when talking to 911. They asked if we wanted to be intercepted by an ambulance, but he told them that it was just faster for us to keep going then to stop and wait. The 911 operator alerted the local police where we were, what we were driving, and why we were speeding (80 in a 45). She also called the ER to tell them we were coming. 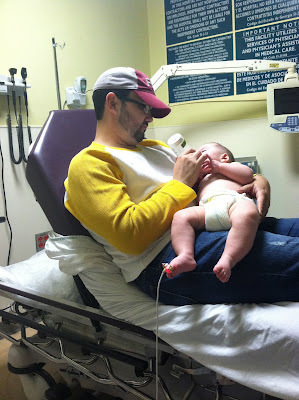 We made it to the ER in about 10 minutes (very fast considering how far away it was), and OF COURSE Cooper stopped making the noise by the time we got there. While we were in the car, he relaxed enough to be able to breathe normally. 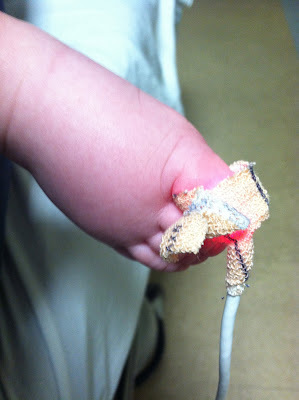 After they started checking his vitals and stuff, he got agitated enough to start hacking and wheezing again. They got us back to a room ASAP and hooked Coop up to a machine to monitor his heart rate and oxygen saturation. His heart rate was a little elevated (around 175), but his oxygen was holding between 98 - 100 (which is good). As soon as the nurse heard him, she said, "Sounds like croup". I have heard of this before, but I have never heard a kid who had it. Once you hear that cough, you'll never forget it! He's so heavy, we had to keep trading out who was holding/cuddling him - haha. We ended up being in the ER for a total of about 4 hours (11:30 pm - 3:30 am). Out of those 4 hours, Coop only slept for about 30 minutes. :( Every time he would go to sleep, they would come in and poke and prod him. 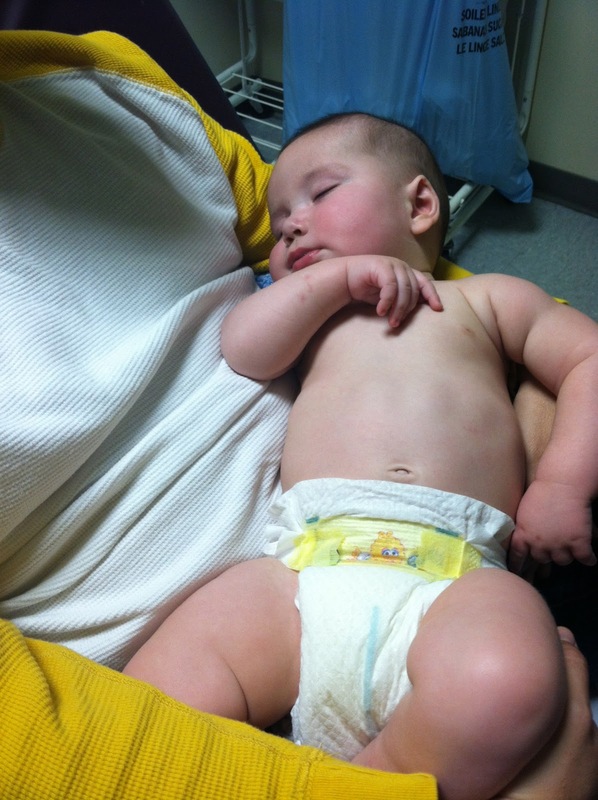 They did a chest x-ray and a test for flu and RSV. Everything came back fine. The doctor said that croup is really hard to diagnose, so his *official* diagnosis was an upper respiratory infection and bronchitis. He got an oral antibiotic and a steroid shot, as well as a prescription for a steroid (to take for another 5 days) and an antibiotic (to take for another 10 days). They said that we would probably notice him doing better in the next day or two, but his cough may hang on for two to four WEEKS. Yay. We finally got home around 4 am (Aunt Missy was asleep in LL's bed - haha). I camped out and slept on the floor of Cooper's room (thisclose to his crib). The next morning LL went to spend the day at Oma and Opa's because Matt, Coop, and I were EXHAUSTED. We spent the rest of the day alternating between cuddling our sick boy and sleeping. I think, at any given point during the day, one of the three of us was asleep. I slept the next night on Cooper's floor, too, just to make sure. We're now almost a week and a half out from that scary experience, and Coop is doing much better. He still has a tiny cough, but it's not "barkey" at all anymore. Other than the tornado, it was for sure my scariest experience as a parent. I am so happy that we got to the doctor so quickly and got meds in him so fast. I really think that's why he has improved so quickly. The steroids made him SUPER hungry and he chowed down for those 5 days (as if he could possibly eat any more), and it also made him have a hard time sleeping (yay.) As soon as he came off of the steroid, he started sleeping through the night (3 days in a row! ), so maybe it was sort of worth it - haha. The next day - trying to feel good even though he wasn't. I'm SO happy my boy is okay, and I hope that we NEVER have to take another child to the ER (especially in the middle of the night!). Random question but I've always wondered about this: did you put him in the car seat??? i have often thought if something happened to my kid and i was rushing to the er i wonder if i'd bother with a car seat or just hold them? Actually - we did! But as I was putting him in, I told Matt I was going to take him out and hold him if being in the seat made him more upset. He did get upset at first, but once we stared moving, he calmed down. I actually think it helped because its what he's USED to. It might have scared him worse if I had held him. But I would have if I needed to! Oh my gosh! I couldn't imagine! So glad he's okay though.